BONUS: Train Free In Our Fitness Kickboxing Class Until Your Start Date! 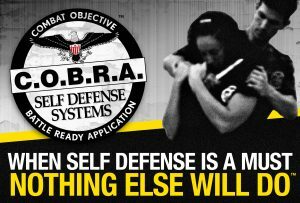 Here’s your chance to join the exciting, acclaimed and eye-opening C.O.B.R.A.™ reality self-defense system that is very effective at preparing you for the real world. It’s easy to learn regardless of your previous experience. The Academy is 5 weeks, (2 nights per week) and will cover basic, intermediate and advanced self-defense techniques. Including, but not limited to: striking, escapes, weapons defense, ground defense, survival training and real life scenario training. All classes are conducted in athletic street clothes in an academy atmosphere. Limited spots available. First come, first served. Many people simply don’t want to think about something so horrible because it makes them feel helpless. But you will see that there are many things you can do. You have many advantages that you don’t even know about. Even a basic understanding and education in this area can save lives. By the time you finish this course, you will know exactly what to and will have gone through it under the adrenalin surge of a safe and simulated reality based scenario. Recommended for families, businesses, corporations, schools, churches. Includes bonus surviving home invasion. AGES 5-11 LIMITED SPACE AVAILABLE SIGN UP NOW!! C.O.B.R.A.™ was created by combining real experience in law enforcement, corrections, multiple combative systems, and military advisement, and is structured just like a police academy. This survival camp will build knowledge on awareness, prevention and the physical skill set on how to survive conflict. How does a criminal think? When should I strike? How do I know something is wrong? Learn strikes, escapes, ground survival anti-abduction and more in this 4 hour class. COBRA is an international program back by law enforcement experience. There are drills, scenarios and techniques that translate to realistic self defense. No board breaking and highly athletic moves. Just real defense for when you need it most. Highlights major components of our 10 Week C.O.B.R.A. Academy. This 1-day camp is based on our 10 Week Police Academy for civilians and focuses on the most common types of violence men-women-juniors face on a daily basis.